Clark Seif Clark provides indoor environmental quality testing and consulting services to identify and mitigate respiratory irritants and asthma triggers. The CDPH’s Work-Related Asthma Prevention Program reports that it found that nearly 10% of all work-related asthma cases were caused by exposure to cleaning products. 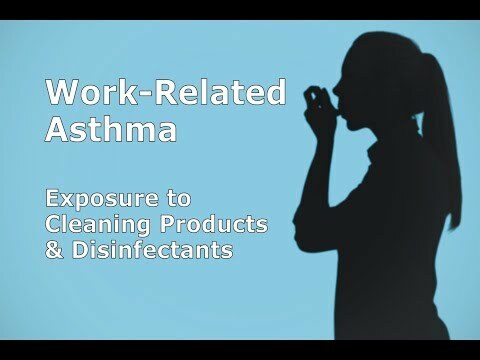 The Occupational Safety and Health Administration (OSHA) describes work-related asthma as a lung disease caused or made worse by exposures to substances in the workplace. Common workplace exposures that can cause the condition include contact with dust, mold, animals, plants and various chemicals. These include some of the chemical compounds used in cleaning products and disinfectants. In fact, the Occupational Health Branch of the California Department of Public Health (CDPH) has published information on this important topic for employers and employees. They suggest avoiding certain ingredients, like bleach (sodium hypochlorite), quaternary ammonium compounds (benzalkonium chlorides) and glutaraldehyde that can cause asthma. The CDPH’s Work-Related Asthma Prevention Program reports that it found that nearly 10% of all work-related asthma cases were caused by exposure to cleaning products. Most of these cases had new asthma that started only after they began work. About one in five people used cleaning products directly, such as janitors. The other 80% of workers attributed their asthma symptoms to cleaning products used nearby.